Today I have debut author Bethany Anderson on the blog for a quick question and answer session. I loved her book Swings & Roundabouts and if you missed my review yesterday do please nip back and read it! 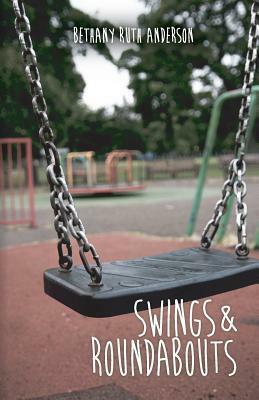 Swings & Roundabouts was published last year by indie publisher Bamboccioni Books and Bethany blogs at Subtle Melodrama. Your book, Swings & Roundabouts, focuses on mental illness and the possibility of two people who suffer from mental illness being together, how did the story come about and was there any major inspiration for the book? Growing up, there were so many people around me that were dealing with mental illness, or who had friends/family that were struggling with it. And yet, no one seemed to really talk about it. It fascinated me that mental health problems seemed so common, and yet not enough people knew what it was, or how to deal with it. Still, there are too many people who think of mental illness as a kind of hysterical insanity, but it happens to ordinary people with ordinary lives. So, for Swings & Roundabouts, I wanted to explore these things – what mental health is, and how it can affect the lives and relationships of ‘normal’ people. The mental illnesses in Swings and Roundabouts were a pretty intense part of the story and came across as very realistic, what kind of research did you do for the book? Much of the research I did for the book was done surfing the internet. There was the factual stuff I had to look at, such as what the mental illnesses entailed, and what side effects there might be for Matt’s medication. But to tap into the emotional, mental part, I spent hours looking through pro-ana sites (motivating and encouraging anorexia), and also reading personal blogs of sufferers of bipolar disorder, and depression. There was a lot that also drew from my own experience of knowing people who have had these issues, and from talking to others about concerns for their friends/family. The book switches between Sarah and Matt’s perspectives and a different point of view is used for each, was there a kind of reason for this or is that just what felt right at the time of writing? Initially, Matt and Sarah’s perspectives were both told from the first person, but I found that it suited to have Matt’s chapters in the third person. Although the narrative is still very close to him, using the third person adds a distance to him, so the reader isn’t as certain about his thoughts and feelings as they are with Sarah’s. I liked having Sarah in the first person so that there’s a direct access to her mind and, perhaps, as a woman myself with an understanding of low-esteem and the pressures of body image, Sarah was easier to write this way. I understand from your blog (which looks great btw!) that you write short stories and poems too, are there any major influencers on your writing in general, any authors who made you really want to pursue the written word? I’ve loved writing from a young age, and I used to write little picture books when I was about eight years old. But the writing bug really bit in my early teens when I was introduced to Thomas Hardy. He’s still my favourite author, with a stunning ability to tell (tragic) stories, and I think he spurred me on to write more of my own. More recently, I’ve been influenced by the likes of Chuck Palahniuk and Haruki Murkami – they both have the ability to make the mundane and the everyday seem so fascinating, and I really admire that in a writer. Interestingly, the authors that I like the best are usually the ones that play with the written word in all sorts of formats, and not just the novel form. Writing poetry and prose keeps a writer on their toes, I think. Do you have one book you will always run to when you want comforting, and if so what is it? For comfort, I like to read something that I’m very familiar with, so I’ll pick up a Victorian classic (yes, even Hardy! ), or go to something like The Chaos Walking trilogy, by Patrick Ness, where I feel I know the world and its characters well. There’s also a book which is part of the Animal Ark series called Sheepdog in the Snow that I used to love to read when I felt unwell! Probably all of the above mentioned authors! Putting Thomas Hardy, Chuck Palahniuk, Haruki Murakami, and Patrick Ness in a room together would be the best tea party ever! I’d also invite Bret Easton Ellis. I realise this is very male heavy, so I think I’d ask Flannery O’Connor to come along too. They’re all particular favourites of mine, and I’d love to pick their brains and listen to them tell stories. Together, I bet we’d all come up with a spectacular plot for a novel, like an author super group. Wow – I can’t even begin to imagine what the story line and the characters would be like!